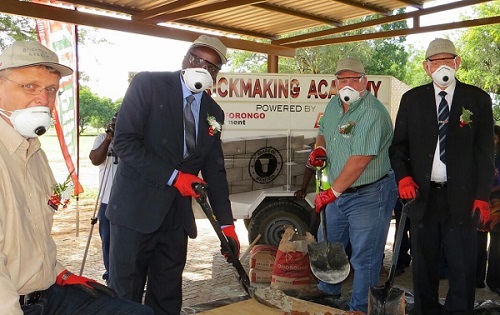 This statement was made on Friday morning, 02 June in Tsumeb when the Minister of Poverty Eradication and Social Welfare, Hon Bishop Zephaniah Kameeta opened the brickmaking academy operated by Ohorongo Cement in partnership with the Build It chain of hardware stores. The minister and the Governor of the Oshikoto Region, Hon Henock Kankoshi were the guests of Ohorongo Managing Director, Mr Hans-Wilhelm Schütte and the Category Buyer of Build It, Mr Paul Hinson. The four dignataries demonstrated to the first intake of trainees that it is not very difficult to make bricks, the apprentices must only pay attention to what they are taught to ensure bricks of a prescribed standard. When they do this, Build It has committed to buy all the home-made bricks for further selling in the Build It stores. In the first intake, a total of 15 people were trained to prepare the aggregate for bricks correctly, to fill the blockmaking machines in the right way, and to cure the bricks after they have set, to ensure that their bricks conform to the standard expected by Build It. Ohorongo said its technical team, together with a support team from Built It, will continue to provide technical assistance and advice to the trainees to ensure the best outcome and high quality bricks. The academy will conduct further training programmes through June to October in Oshana, Ohangwena, Omusati, Otjozondjupa and Khomas. Sir, is it allowed to park the aerie here?